How do you brief your French estate agent? You’ve probably seen the snippets on property programmes where they quickly run over what the participants are looking for – three bedrooms, two bathrooms, bit of outside space – and it’s all over in five minutes and they’re off to look at properties. Within three homes, they’ve found the ideal one. Well, let’s just say don’t believe everything you see on TV! No-one can get a comprehensive idea of what you’re looking for with just a short chat. A good French estate agent will take the time to get to know your needs and should not be fazed by spending a good few hours with you. Indeed, several visits over different days may be in order to help you find the right property. Get the most out of your French estate agent with my tips. In my experience, when instructing any agent, it’s key to try to give them as clear a brief as possible of your criteria but at the same time be open to ideas. They may ask you what, if anything, you are happy to compromise on. For example, perhaps you can do with one less bedroom in order to find a place which needs no work or has a larger garden for your budget. Think about what is vital to you and what you can perhaps do without if necessary and let them know. 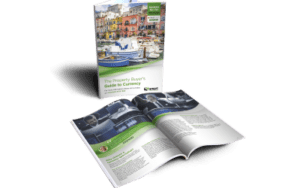 Find out more about getting the most from your estate agent with our insider guide, How to Negotiate Abroad. Another point I find useful is, if you’ve already seen some homes from another agent that were ‘good but not quite there’, to send them as exemplars to the agent. It gives them a good idea of the generally ballpark you’re looking in, and you can show what you don’t like about them too as things to avoid. Once you and your agent have narrowed down your choices, then it’s time for a viewing trip! This is an exciting stage, but it can easily go wrong. Again, a good agent will make sure it’s not heavily sales-laden. At the end of the day, they are there to make a sale – but there’s a difference between selling you something you know you’d like and just anything! A good viewing trip will have no compulsion to buy. A good sign is that the agent has previously done multiple viewing trips with the same client: although it’s ideal to find your dream home on the first trip, having a history of doing more than one shows you won’t be pushed into a sale at the first chance. Instead, it’ll be about helping refine your criteria and find the right house that really suits you. As a general rule of thumb, try to keep the number of properties you see a day limited to maximum seven. Any more and they start to blend together, and you’ll find yourself wondering if the extra-size living room was the first one, or the third one, and was it the second one with the noisy road? Remember that France is a big country! You may have earmarked a certain area or department but to find your dream property, you may need to travel a fair way between suggested properties. Again, a good agent will be happy to assist with this and afford you as much time as it takes for you to find what you are looking for. The French love some good service après-vente, or after-sales service – and that goes for estate agents, too. Many French estate agents will offer a lifestyle package. They’ll help you with other services such as finding and opening a bank account, explaining about the two property taxes (taxes d’habitation and foncière, if you’re wondering) and help change utilities into your name. This is where a local one really comes into their own: having someone who speaks the language and knows the system makes integrating so much easier. As with any professional service, there are good and bad agents out there so bear in mind all of the above as you go about your search and remember that it is still a buyer’s market in France so you are in the driving seat (or, as the French say, you’re holding the reins)! The first thing to check is that they have professional accreditation – it’s a regulated profession in France. We’ve carefully built up our own network of trustworthy French estate agents over fourteen years, and are more than happy to provide you with an introduction. Simply fill in our enquiry form, or give the Resource Team a ring on +44(0)20 7898 0549/email france@propertyguides.com.